Thornbury Subdivision in Springdale, AR is a gorgeous neighborhood with lots of trees and character. Large estate sized lots with a variety of homes. 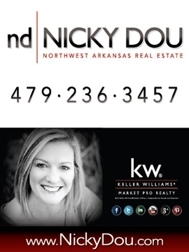 Call Nicky Dou with Keller Williams Market Pro Realty for more info on this amazing subdivision in Springdale OR if you are thinking about SELLING YOUR HOME in Northwest Arkansas!